I will provide a simple (I mean simple) explanation of Carburetor theory. This explanation will not be gospel, please understand there are many factors which affect Carburetor operation. During the Intake stroke the air pressure in the cylinder will be lowered. 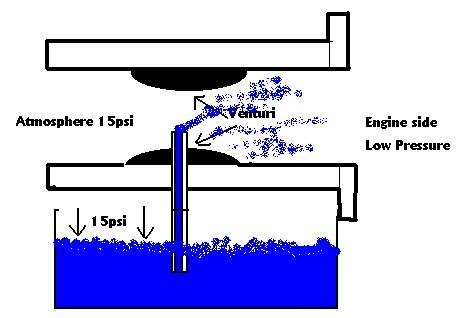 This is due to the fact that the piston has moved down in the cylinder and the cylinders volume has increased. The intake valve will open, and a mixture of air and fuel will enter the cylinder. The reason the air enters is due to a difference in air pressure. The air pressure outside the engine (atmospheric air pressure) we will assume is at sea level, 14.7psi (pounds per square inch) remember science class. Before the air enters the engine we cause it to pass thru that magical device called the carburetor. The carburetor depends entirely on air flow, to deliver an atomized mixture of air and fuel molecules to the engine. 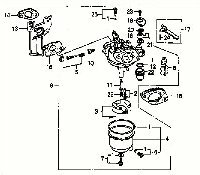 Most diagrams of carburetors are complex and confusing in the next few pictures I will attempt to simplify the carburetor. This simplification is for explanation only, Carburetor layouts differ. 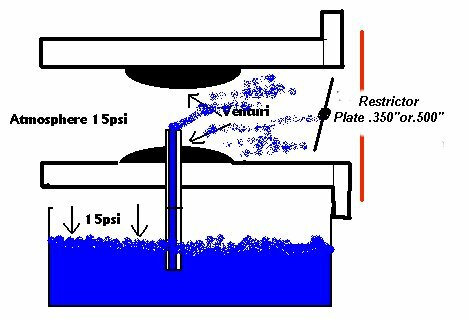 As the air attempts to rush through the carburetor, it must pass thru the VENTURI. 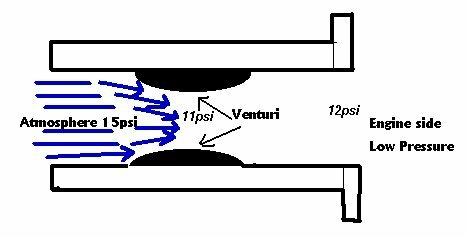 The venturi affect states as a fluid passes thru a restriction it's velocity(speed) increases but pressure decreases. We now introduce the fuel to the air flow. Stick a tube into the venturi which has it's other end in a fuel supply. Again a difference in air pressure will cause the fuel to flow into the throat of the carburetor. 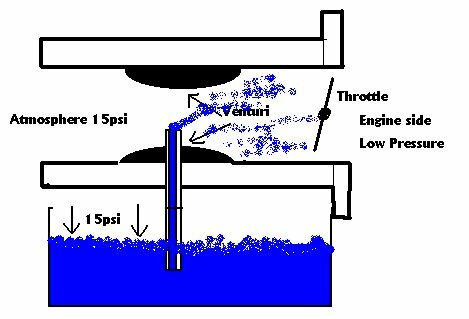 The fuel is held in the float bowl, this fuel has 15psi pushing on it, the venturi will have a lower pressure. Fuel will be pushed up the tube into the air flow. We control the speed of the engine with the throttle plate which limits the amount of air that can be drawn through the carburetor. Less air entering the engine= less fuel=slower speed. We can also control the engines power output by restricting the air flow, we install a plate at the entrance to the engine which limits the amount of air the carburetor can flow, thus less fuel, less power. At the bottom of the fuel pick up tube we install a precisely drilled jet. This jet controls the amount of fuel which can be drawn up the tube. 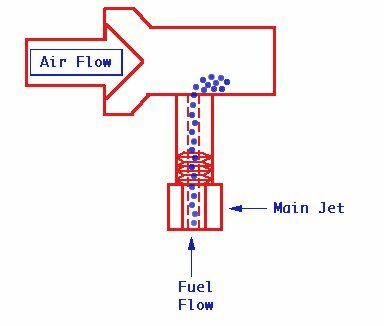 The jet plays an important role in controlling the ratio of air/fuel. The jet can be changed to control this mixture. There are many reasons to change a jet. Almost anything you do to the engine will affect this ratio, air filter, timing, exhaust etc. We usually can determine the jet size by examining the spark plug. A spark plug which appears sooty black MAY indicate too rich a mixture(too much fuel). A plug which is chalky white is operating in a lean condition (not enough fuel). Ask for advice here as many factors come into play. Now let see what that emulsion tube that they always talk about does. 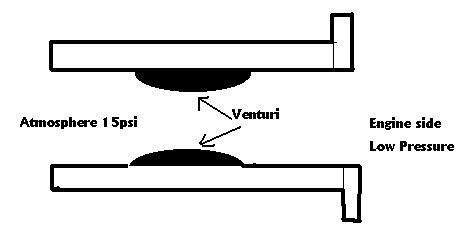 The emulsion tube is part of the pickup tube that delivers fuel to the venturi. This tube can be drilled with various size holes, air will be forced thru these holes. 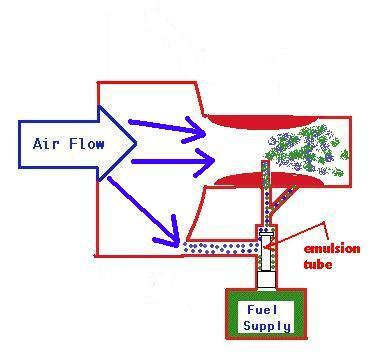 The amount of air introduced to the fuel will affect how the fuel is atomized as it enters the venturi. The number, size and location of these holes will have an effect on the fuel/air ratio, and emissions of the engine.